50 writable stickers on 3D hologram Eggshell foil in the format approx. 70x100mm. We recommend varnish or permanent markers for writing. The reverse side of the material is not slit. The stickers are not removable. 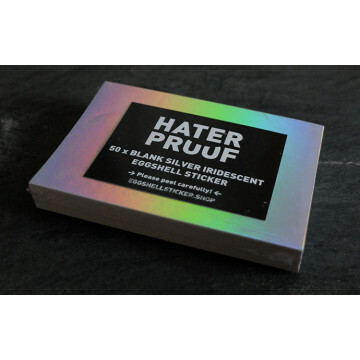 50 writable stickers on silver-iridescent Eggshell-foil in the format approx. 70x100mm. We recommend varnish or permanent markers for writing. The reverse side of the material is not slit. The stickers are not removable. 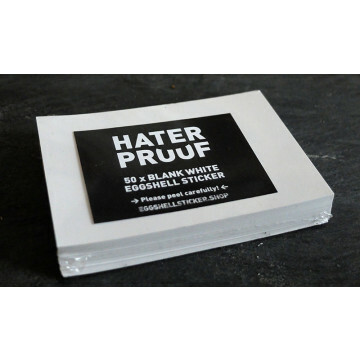 50 writable stickers on white Eggshell-foil approx. 70x100mm. We recommend varnish or permanent markers for writing. The reverse side of the material is not slit. The stickers are not removable.